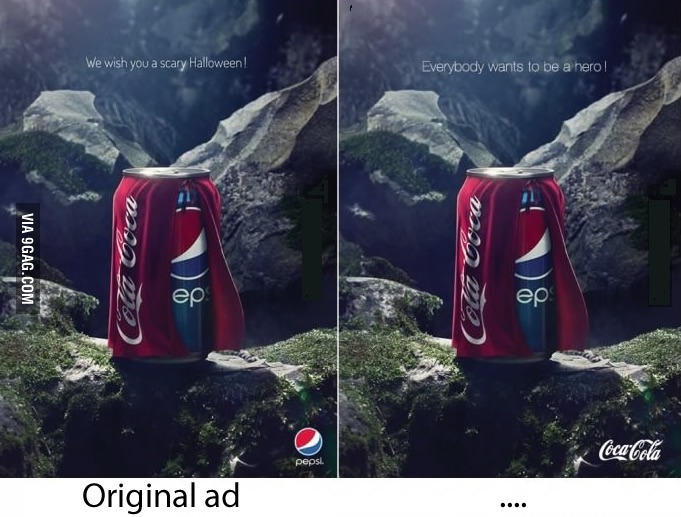 For 2013's Halloween, there's an ad on the internet about a Pepsi can with a Coke costume, stating it's “scary”, to which Coca Cola responds with “Everybody wants to be a hero”. So far, so good, but the only reference I have been able to find is both images side by side, with a “via 9GAG.com” legend on the side. Considering that 9GAG is not a reliable source and anybody can upload images there, I'm skeptical about these ads. Are they real? Did Coca Cola really respond in such a way to Pepsi? The first one is apparently real. This site and this site claim it's from a specific (Belgian) ad agency. The first image doesn't have the 9GAG logo; and "Coca Cola" is mispelled. That ad agency currently features a different Pepsi ad (showing that the agency has Pepsi as a client). Not the answer you're looking for? Browse other questions tagged consumer-products . Is standing near Lake Karachay for an hour fatal? Is the Coca-Cola recipe a secret? Is Coca Cola harmful for one's health? Is this “Remove child before washing” clothes label real? Does Coca Cola taste different in glass bottles?